Steaming Cup of Coffee in shades of mocha, auburn, black and gold. The design will be embroidered on the bib in the centered position. * Because this will be a custom piece, created for you based on your color selections, please allow 5-7 business days for logo embroidery plus shipping time. Please understand that once an item has been personalized for you, it may not be returned or exchanged for reasons other than Manufacturer Error or Defect. To ensure you are satisfied with your product, we welcome the opportunity to assist you with questions prior to placing your order. The current trendiness of gourmet cooking has made the apron a very popular kitchen fashion accessory. Everybody, from television cooking hosts to home chefs to microwave moms, is returning to the kitchen, all wearing aprons. There is, however, no reason to still appear in the kitchen in the traditional plain white or blue stripey apron; remember that any apron you wear will add to the ambience of the kitchen you work in and the overall impression conveyed to your guests or customers. Cooking is now considered as a form of art, a work of love and something to do for or with your loved ones. It is no longer sexist, as men are just as comfortable in the kitchen as women. This creates a need for a unisex type of apron, simplistic and without frills, but a fashionable designer item that has something "different" to it. The apron obviously needs to be functional. Its primary function is to protect your clothes from being soiled and should be easily washable without staining permanently. This specific apron is made from a very durable poly-cotton fabric, which was treated with a soil-release technology, so it comes highly recommended for busy restaurants, where aprons are worn all the time. Going for a coffee motif on your apron is always a good idea. The current coffee craze has seen the rise of coffee shops everywhere, from specialty coffee shops to bookshops and churches. The coffee shop or restaurant is no longer considered to be merely a commercial place, but a space that now has acquired different functions. It provides not only your daily steamy cuppa, but also games, comfy chairs, tables and a Wi-Fi connection. It has become a space to stop by and to gather, to relax or to continue working on the go. With more than 183 million coffee drinkers in the US, a coffee aroma is considered by most people to be welcoming and homely. Businesses use this knowledge to their benefit. So do real estate agents, who will require owners of a house that is on show to have a cup of coffee brewing to make the house seem more inviting. It is also important to know that customers of specialty coffee establishments frequent these places because they`re looking for something out of the ordinary and something special - and they don`t mind paying for the experience. The ambience has to be different, relaxing and trendy and the look of your waiters and kitchen staff will add to the overall impression. Restaurant and coffee shop owners would do well by having their staff walk around in aprons embroidered with a creative coffee motif, as it creates a welcoming, informal atmosphere. Those who want to buy the apron for their own kitchen won`t go wrong, as it can be worn by both partners. It is a great conversational piece, sparking conversations about your different, favorite coffee roasts and must-tries. 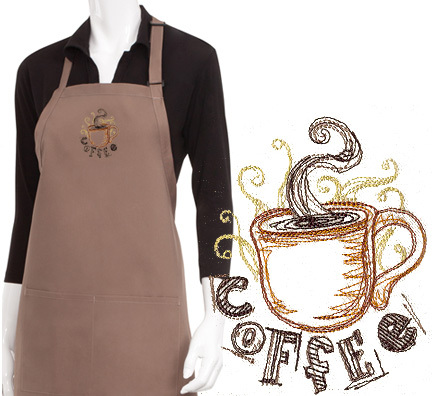 A coffee-embroidered apron also makes a great gift to a friend who is either a coffee lover or a foodie. The apron can be customized and you can choose your own colors. If you are unsure about which colors to go for, keep in mind that the current trend is natural main colors such as mocha or cinnamon and bright, almost primary colors for design accents. In this case, you could choose an apron of a neutral color and have it embroidered in funky tints of more bold colors. You could maybe make up a gift pack for your friend, including a couple of packets of exotic coffee bean blends, such as the ones you can find online at www.caffesociety.co.uk.